Guatemala City – Guatemala‘s elections are just two and a half months away, but whether the leading presidential contenders will end up on the ballot, disqualified, or even behind bars is still up in the air. “There is so much uncertainty,” Iduvina Hernandez Batres, the director of the Association for the Study and Promotion of Security in Democracy, told Al Jazeera. “Two weeks after the campaign began, at this stage there is no clarity as to who overall will be candidates for the presidency,” she said. The official campaign period for the June 16 general elections kicked off on March 18. Of the 27 political parties in the Central American nation, 24 declared presidential candidates. An August 11 presidential runoff is expected. The three individuals expected to lead the presidential race are the runner-up from the previous election, a former attorney general, and the daughter of an ex-dictator who stood trial for genocide. But all three are mired in controversy and legal battles that could exclude them from the ballot. On Monday, the electoral tribunal ruled to annul the registration of former Attorney General and Semilla party presidential hopeful Thelma Aldana as a candidate, upholding challenges by political rivals. The major setback comes on the heels of a warrant for Aldana’s arrest. “We now understand how powerful the weight of a whole system can be when it colludes to block someone’s participation,” Semilla party deputy secretary Ligia Hernandez Gomez told Al Jazeera. “There is a clear intent by political parties to prevent participation,” she said. During her 2014-2018 tenure as attorney general, Aldana played a pivotal role in the prosecution of high-level government officials for corruption. In 2015, then-President Otto Perez Molina was forced to resign and was arrested, as were the vice president and the heads of several government ministries. Working closely with the International Commission Against Impunity in Guatemala (CICIG), Aldana’s office began investigating current President Jimmy Morales, his relatives and the ruling party. They deny all wrongdoings. Semilla has its roots in mass protests against political corruption that precipitated the fall of the Perez Molina administration. Focused on building more participatory and inclusive democracy, the Semilla party is generally centre-left, but its clear position against corruption draws a broader spectrum of supporters. Aldana identifies herself as right-wing. On March 17, the electoral tribunal registered Aldana as Semilla’s presidential candidate. A judge had issued a warrant for her arrest the day before. Aldana was in El Salvador at the time and has not yet returned. She is accused of embezzlement and falsification of information on public documents in connection with a contract for training services that were allegedly never rendered. By law, from the moment candidates are registered they have immunity from prosecution and arrest that can only be stripped through special proceedings. But despite Aldana’s initial registration, officials stated that immunity would only come after legal challenges were resolved and that the warrant remained in effect. The electoral tribunal annulled Aldana’s candidacy on Monday, determining that a required document from the comptroller’s office was no longer valid. The Semilla party’s plan to appeal the ruling is well under way. Leopoldo Garcia, an electoral tribunal official, came forward publicly on March 20 and told reporters he had been under intense pressure to not register Semilla as a party or Aldana as a candidate. Last week, he held a press conference to denounce subsequent threats to himself and his family from far-right groups and said he would request precautionary measures from the Inter-American Commission on Human Rights. “We have nearly everyone trying to stop the participation of Thelma Aldana,” said Hernandez Batres. Semilla now has five days to file a motion with the Supreme Court for a review and reversal of the electoral tribunal’s decision. Should that fail, the only remaining option will be an appeal to the Constitutional Court. Aldana’s is not the only candidacy embroiled in court proceedings. The eligibility of Zury Rios, the right-wing Valor party’s presidential candidate, will soon be the subject of a final Constitutional Court ruling. Rios is the daughter of Efrain Rios Montt, a former military ruler who was convicted of genocide in 2013 but then died last year before his partial retrial concluded. More than 80 percent of the estimated 200,000 people killed during a 36-year civil war between the army and leftists rebels were indigenous Maya. Rios Montt took office in 1982 in a military coup. The Guatemalan constitution prohibits anyone who took power by force from running for president, but the constitutional ban also extends to relatives up to the fourth degree of consanguinity. Despite the ban, Rios was registered as a candidate and her eligibility has been in dispute, with the Supreme Court ruling she can run and the Constitutional Court ruling she cannot. There is only one ruling left and the Constitutional Court has the final say, but there is no guarantee Rios will respect it. “What we will probably see is the Constitutional Court rule definitively in favour of the motion of the election tribunal to prohibit her from participating, and she will probably end up defying the resolution of the Constitutional Court, engendering an element of chaos,” said Hernandez Batres. 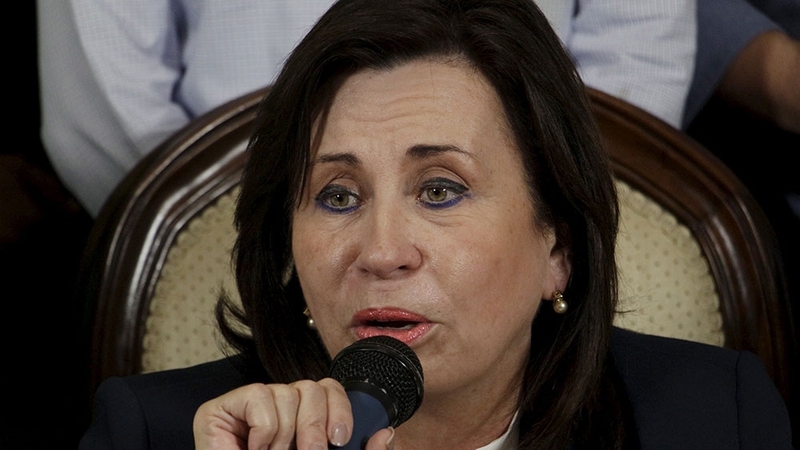 The candidacy of Sandra Torres, the candidate of National Unity of Hope (UNE) party expected to lead the race for president, is currently not the subject of a legal battle but she may end up in court anyway. Torres first attempted to run for president in 2011 at the end of her husband Alvaro Colom’s term in office. Despite their divorce to circumvent a constitutional ban on a sitting president’s relatives from running for office, the Constitutional Court nixed her candidacy. In 2015, she ran but lost to Morales in the second-round runoff vote. The UNE was founded as a social-democratic party, but as investigations into government corruption broadened, it has recently occasionally aligned itself with the ruling party and others in Congress. The alliance has been popularly dubbed the “Pact of the Corrupt”, accused of conspiring to mutually safeguard immunity from prosecution. Torres and the UNE now face the same scandal Morales and the ruling FCN party have – alleged illegal campaign financing in 2015. Charges were filed shortly after Torres was registered as a candidate, which granted her immunity from prosecution, and the Supreme Court upheld that immunity. Last week, however, Guatemalan newspaper Prensa Libre leaked an audio recording in which Torres appears to be discussing several million dollars in unreported campaign financing. Prosecutors have since filed a motion with the Constitutional Court in another attempt to strip Torres of her immunity from prosecution. The UNE responded by accusing prosecutors of leaking the audio. In the end, the fates of all three top presidential contenders could be determined by the country’s highest court. But two weeks into the campaign, uncertainty persists. Many aspects of the current election process are atypical, said Hernandez Batres. The campaign period is extra short. The top presidential contenders are women. They all face court proceedings that could take them out of the running. There is a new election law with more restrictions on campaign financing. Even the very first act was unusual, Hernandez Batres added. Ever since the transition from military rule to elections in 1985, the official call for elections is a solemn act, with the heads of all three branches of government in attendance in a show of support for the electoral tribunal and process, she told Al Jazeera. “This year, for the first time, the electoral tribunal was alone. The executive branch president did not show up, nor did the president of the legislative branch or that of the judicial branch. The Constitutional Court was not there. The heads of the main political parties were not there,” she said. “It is as though they are preparing to claim fraud if the results are not in their favour,” said Hernandez Batres. Jorge Santos, the director of UDEFEGUA, a national human rights organisation, is also concerned that a stage is being set to control the process and results. Santos views the massive uncertainty as to who will be able to participate as candidates this late in the game as telling. “It calls into question the legitimacy of a process that from the beginning has been plagued by vicissitudes,” he said. President Morales and some candidates have made public remarks questioning the role, capacity and legitimacy of the electoral tribunal and the courts that play key roles in determining election candidates and results, Santos noted. “It would appear that there is an explicit intention by the Pact of the Corrupt not to permit an election scenario in which they will not win,” he said. Attention remains largely focused on the presidential race and the legal battles of the frontrunners, but at the local level, municipal race candidates are being killed. Political violence has marked past election periods and online hate speech, attacks and other incidents all indicate this year will be no different, said Santos. Two mayoral candidates from the Fuerza party were murdered in February, and a local candidate from the People’s Liberation Movement party was murdered last month.